Here at Pixel and Timber, we share a communal appreciation for products that encourage the user to better themselves in order to get the most out of the product. It seems like increasingly frequently devices are being developed with a goal of limiting user interaction as much as possible to reduce the opportunity for error, and for this project we chose to explore an industry that highlights the opposite. Carpentry hand tools are the pinnacle of purity, and require the user to provide 100% of the inputs for the tool to perform well. From sharpening the steel, to setting the depth of cut, to guiding the tool along a work piece, to understanding the way the cutting edge interacts with various wood grains; without a well-skilled user a hand tool is rendered essentially useless. A tool that highlights the skillset of the user more than any other is the humble spokeshave. A spokeshave enables an experienced user to perform a huge breadth of tasks such as carving, edge planing, edge contouring, surface scraping, and much more all with a single tool. This versatility is heavily based in the simplicity of a spokeshave’s design. In its most elemental form, a spokeshave consists of an adjustable blade attached to a set of handles. This simplicity removes almost all of the variables from the tool, and places all of the control in the hands of the user - literally. Across the hand tool industry, the majority of modern manufacturers are making high quality tools using the same processes that were used to make tools in the early 1900’s. The traditional use of cast iron and brass paired with elegant hand worked wooden components has become an iconic aesthetic of the hand tool industry. While this construction celebrates the tools history, we wanted to design a spokeshave that celebrates its performance. Looking across other iconic industries, almost all of them have seen great progress from leveraging advances in material technology and manufacturing methods. For example, the bicycle has been around since the dawn of human powered transportation, but the bicycles of today are hardly comparable to the heavy steel bikes of the early 1900’s. By utilizing modern materials such as carbon fiber and CNC machining lightweight components from aircraft grade aluminum, today’s bicycles are significantly lighter, stiffer, more comfortable than their steel counterparts. All of these advancements add up to a bike that is still ridden the same way a bike was ridden in 1950, but is far more efficient for the user, and magnifies their input to generate maximum output. 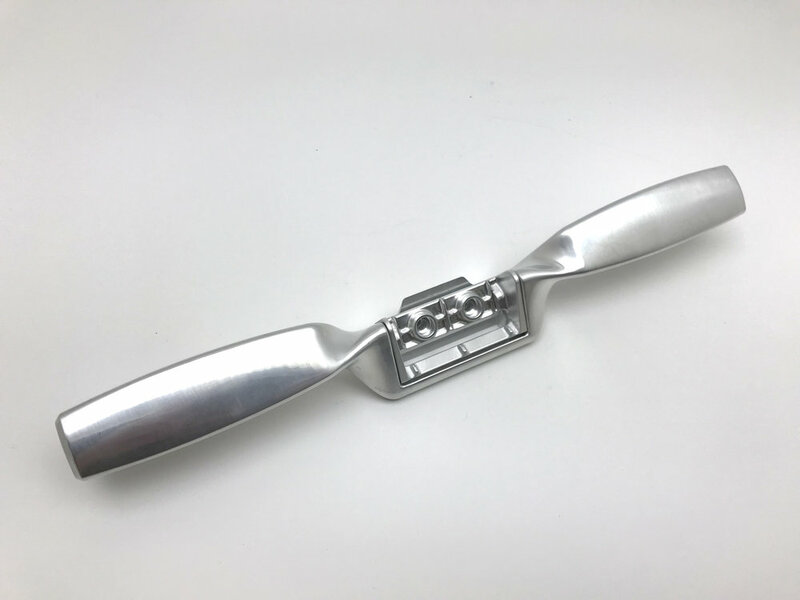 In the same way, we chose to leverage the characteristics of modern materials and manufacturing methods to design a spokeshave that eliminates variables and magnifies the skills of the user, all while staying true to its historic simplicity and form factor. Our spokeshave is designed to call back to the simplicity of a traditional spokeshave, while highlighting the use of modern materials and processes. It is constructed of 3 components featuring only 2 fasteners. Limiting the total number of components streamlines assembly and results in a tool that eliminates joints between components. This means that our spokeshave will have no problems surviving an accidental drop onto the shop floor from even the tallest carpenter. Given that the blade is perhaps the most critical component to a great hand tool, we designed our own to be the perfect match for our spokeshave. The blade is water-jet cut from 1/8 inch thick A2 tool steel which is harder than its O1 counterpart, meaning that it will stay sharper longer. The beefy 1/8 inch thickness of the blade eliminates the need for a chip-breaker, and helps to reduce blade chatter resulting in a smoother cut. The cutting edge of the blade features a 35 degree bevel, and the blade can be mounted in the spokeshave with the bevel facing up or down. This allows the user to increase or decrease the angle of the blade relative to the work piece to be best suited for certain tasks. Having the blade bevel-down provides a smoother cut and reduces tear out, while having the blade bevel-up provides a more aggressive cut to quickly remove material during roughing passes. Lastly, the two slots in the blade provide plenty of blade depth adjustment and allow the blade to be retraced up into the spokeshave body to protect the cutting edge during storage. The body and handles are CNC machined from a single piece of 6061 T-6 aluminum giving it the perfect blend of strength and light weight. Machining the entire body results in a perfectly flat sole and blade bed that doesn’t require any post processing to finish. The unibody construction eliminates the joint between the body and handles which is the most common point of failure on traditional spokeshaves, rendering our spokeshave essentially indestructible. Lastly, the triangular profile of the handles helps to register the tool in the user’s hands, giving them unmatched precision. 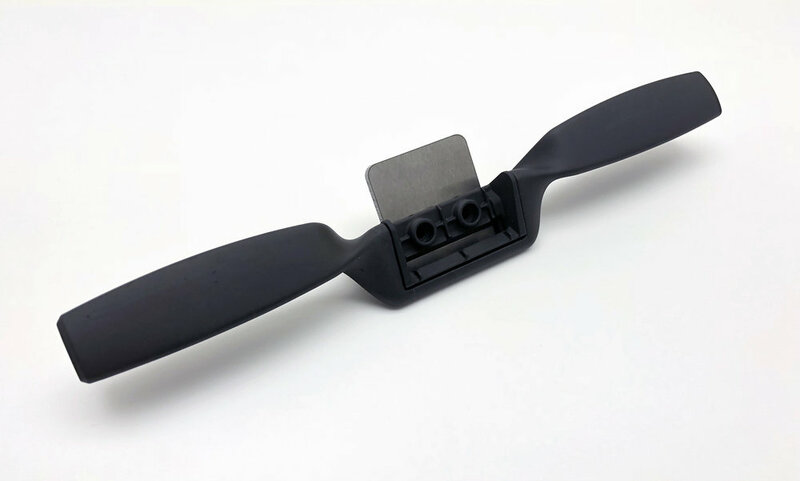 The blade cap is also CNC machined from 6061-T6 aluminum, and features an oversized slot to clear chips efficiently. The dual fasteners help to register the blade within the spokeshave body to ensure that the cutting edge of the blade remains parallel to the sole, providing a consistent cut. 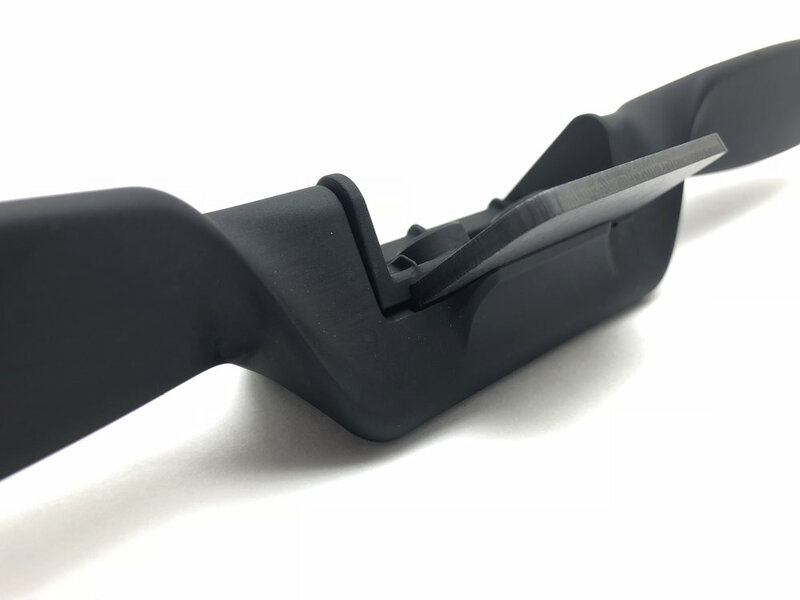 Lastly, when installed, the blade cap has a large surface area of contact with the face of the blade which further reduces blade chatter for a smoother cut. 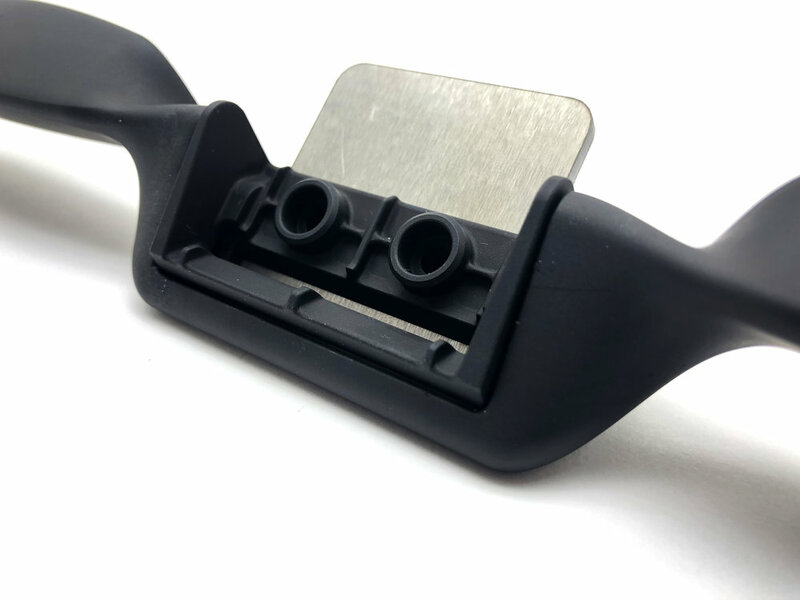 Due to the low volume at which this spokeshave is likely to be produced, it was important to design it with as few molded components as possible. 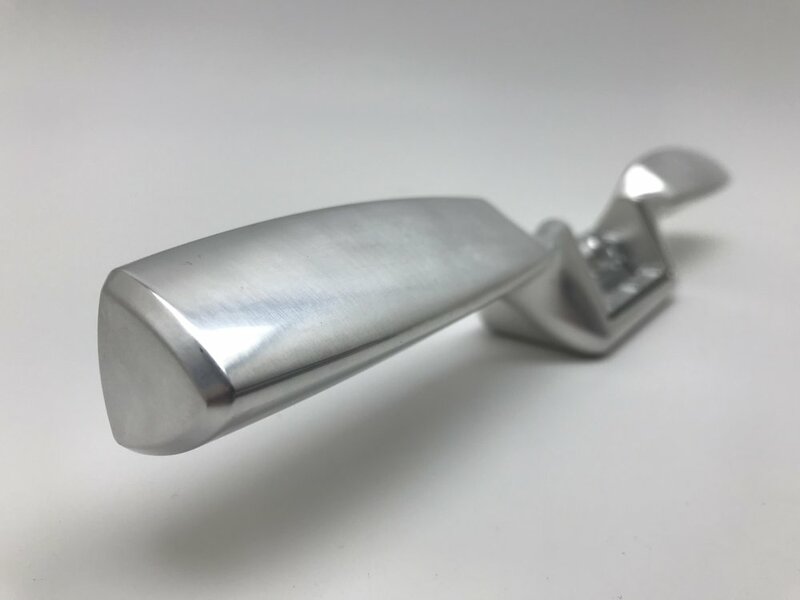 We achieved this by leveraging CNC machining and water-jet cutting to reduces the cost of tooling, and allow us to manufacture each spokeshave on demand. This would open up nearly endless possibilities for customizing materials and finishes. 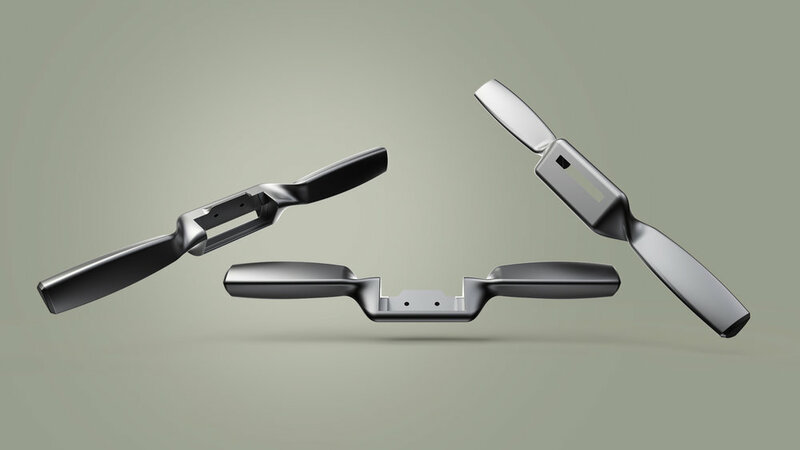 We’ve highlighted the aluminum version above, but the machined components could be cut from a variety of metals including titanium, brass, stainless steel, and more. 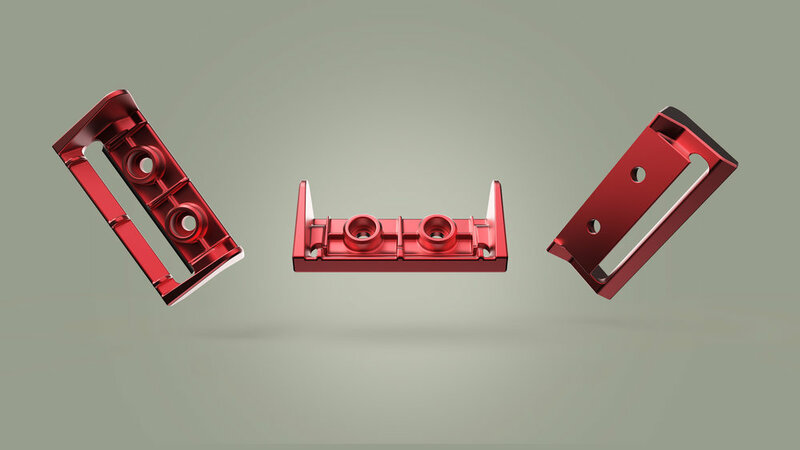 Beyond the base material, there are also a wide variety of finish and plating options that could be applied to the machined parts on an order-by-order basis. Below is a small gallery of possible plating and material combinations. We've received our first production unit from our manufacturing partner. The photos below show this first article in its finished and anodized state, as well as some process shots prior to finishing and anodizing. These units will be available as made-on-demand products in April, 2018. Please check back for pricing and lead times or use the form below to be contacted when these items become available. Thank you! We'll contact you when this product is available!